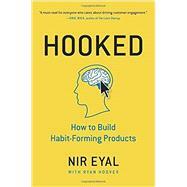 Hooked is based on Eyal’s years of research, consulting, and practical experience. He wrote the book he wished had been available to him as a start-up foundernot abstract theory, but a how-to guide for building better products. Hooked is written for product managers, designers, marketers, start-up founders, and anyone who seeks to understand how products influence our behavior.  Actionable steps for building products people love.  Fascinating examples from the iPhone to Twitter, Pinterest to the Bible App, and many other habit-forming products. Nir Eyal writes, consults, and teaches about the intersection of psychology, technology, and business. He spent years in the video gaming and advertising industries, where he learned and tested the techniques described in Hooked to motivate and influence users. Since 2003 he has started and sold two technology companies. He is a frequent speaker at industry conferences and Fortune 500 companies, and has taught at the Stanford Graduate School of Business and Design School and the Hasso Plattner Institute of Design. His writing has appeared in Harvard Business Review, The Atlantic, Forbes, TechCrunch, and Psychology Today, among other outlets. He lives in Palo Alto, CA, and blogs at NirAndFar.com.